Taiwan Q3 [Wang] Gas Regulator firepower (General Type), Wang adjuster firepower, Gas Parts - Turng Liin Industrial Co., Ltd.
(2) Application: water heater (18 liter). 3 Applicable Stove: Hourly consumption of energy 36000kcal / h below are applicable to such gas stoves: gas cooker, seafood stove, two / three-ring gas stove, water heater (18 liter). 4 smooth flow design, enabling full advantage of firepower, thermal performance of fully released, and thus enhance the performance of gas appliances, to save gas effect. A two-year replacement identify colors, to remind technicians and consumers to reduce supplies expired or the potential risk of deterioration, improve your gas appliance re-use security. 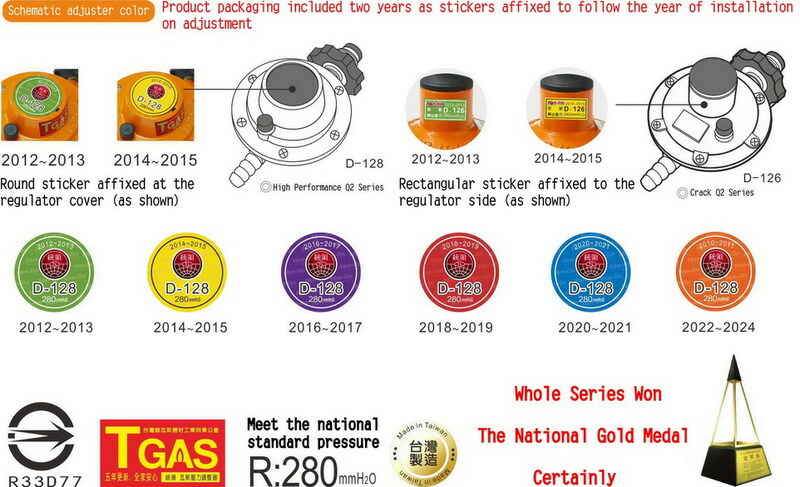 Rubber tube to prevent loss, aging, cracking, rat bite, burn, causing lots of leaking the internal safety device to adjust automatically shut down gas to prevent accidents to ensure safety.